Are Flip Flops Good For Your Feet? They may be fun to wear, but flip flops are simply not good for your feet. In fact, wearing flip flops for long periods of time can wreak havoc on your feet and toes, causing you to need an orthopedic surgeon. Wearing flip flops when you walk across the locker room floor or from your patio chair to the pool won’t damage your feet. But if they become your everyday footwear, your feet and ankles could pay the price. Read on to learn about how flip flops can lead to joint problems, the need for physical therapy or even orthopedic surgery. Many flip flops don’t offer much in the way of arch support. That means your plantar fascia — the thick band of tissue that connects your heel to the ball of your foot — doesn’t get the support it needs when you wear flip flops. A lack of support leads to inflammation and a condition called plantar fasciitis, which makes walking painful and can ultimately lead to fallen arches. Flip flops don’t hold your feet in place very well. Combine constant motion and sweat and you’re at risk for developing painful blisters and calluses in your foot pads and between your toes. Without proper shock absorption in your shoes, you could experience stress fractures in the bones of your feet. Wearing flip flops while standing or walking for long periods of time can cause minute cracks in your foot bones. 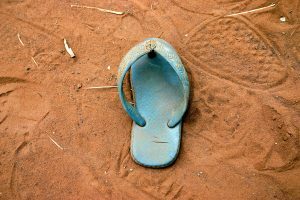 To keep a flip flop on your foot, your toes must grasp the shoe almost constantly. Constant gripping can cause tendonitis in your toes. The condition is quite painful and can lead to tears or ruptures of your tendons. Wearing flip flops too often can also cause bunions or hammer toes to develop. Hammer toes occur when the joints contract, causing your toe to bend abnormally. You change the way you walk when you wear flip flops. Therefore, your entire body must adjust. Changing your gait even slightly can lead to problems with your ankles, knees, hips or back. If you’re having trouble with your feet, please contact our office for an appointment. Our skilled physicians and physical therapists will assess your condition and develop a treatment plan that will restore your body’s function and free you of pain.